Only a few things in life are as good as this silky Classic Cheesecake. Right on time for Mother’s Day! So I decided to make a homage to her – my best friend and favorite woman in the whole world – by making her favorite dessert: classic cheesecake! Every time she visits me in New York City, she has to get a slice of NY cheesecake. We usually go to Junior’s or The Cheesecake Factory so she can indulge in her slice of plain classic cheesecake. That’s an obsession I never understood. You see, I’m usually not a cheesecake person. Whenever someone offers me a slice, I expect it to be dense, overly sweet and rich. I’ll eat a few forks full just to be polite but will eventually set it somewhere and go explore some other desserts. It took me a few attempts at making cheesecake to come up with THE one and to be comfortable sharing a few of “my secrets”. A huge thanks for my taste testers, aka coworkers, or I wouldn’t be able to eat all that food by myself. 1) The first secret is to add 1 cup of sour cream to the batter, which makes the classic cheesecake creamy and give it an extra tanginess that the cream cheese alone can’t achieve. 2) Adding a few tablespoons of starch (flour or corn starch both work!) will help prevent cracks. Also make sure you don’t overbake your cheesecake and cool it gradually (I let it sit in the oven, for about 1 hour, with the door slightly open!) as those are the main reasons for cracks. 3) Before I add the eggs, I mix the batter on medium-high speed for a long time, at least a couple of minutes more than what the recipe asks for. There’s nothing worse than a lump-y cheesecake, so it doesn’t hurt to go the extra mile. Give it an extra hand with a spatula, every now and then, to make sure that everything is being incorporated nicely. 4) Always bake your cheesecake in bain-marie (water bath). This technique creates a steamy environment where the cake will bake gently and evenly which prevents it from drying and ensures a smooth cheesecake. To make a water bath, just set the springform pan (with the batter already in it! ), wrapped in foil so water doesn’t get it, in a large baking pan. Then, fill it with boiling water – just enough to cover 2 inches of the springform pan – and bring it to the oven. 5) While you absolutely must chill the cheesecake overnight (so it can set), you should serve it at room temperature. I find that it is much creamier and velvety if you let it stand at room temperature for at least 30 minutes before serving. 6) I learned this recently, but from now on I’ll always store my cheesecake uncovered. This prevents the top of the cheesecake from getting mushy as condensation won’t build inside the container. Oh, and please cover the whole cheesecake with fruit, if you’re doing it. I did buy – or asked my husband to buy – 3 pints of raspberries. But on his way home he decided to show off the good samaritan that he is and tried to catch a ball that was going to end up on the street and ended up dropping my raspberries, which caused some of them to be smashed. So excuse my lack of enough raspberries! Preheat the oven to 350 degrees with a rack in the middle-lower part of your oven. Wrap the pan in foil, making sure the bottom is completely covered. Reserve. Crush the graham crackers in a food processor until finely crumbed. Mix the crumbs and the melted butter until it resembles wet sand. Transfer that mixture to the springform pan and press evenly onto the bottom. Bake the crust for 8 to 10 minutes or until it starts to brown slightly. Take it off from oven and let it cool. Beat the cream cheese, the sour cream, the sugar, the cornstarch, the salt, the lemon juice and the vanilla extract until creamy and without any lumps, about 5 minutes on medium speed. Make sure you give it some extra love with a spatula, so everything gets incorporated! Mix the eggs, one at a time, over low speed, just until blended. The mixture should be creamy and silky. Set the springform pan - still wrapped in foil - in a baking dish. Fill it with enough boiling water to cover 2 inches of the bottom of the pan. Bring the whole set to the oven and bake at 350 degrees for 55 minutes or until the outside looks slightly puffed but the center is still jiggly. Once cheesecake is done, turn off the oven but keep the cheesecake in there, cooling for at least one hour with the oven door slightly open. After one hour, transfer cheesecake to a wire rack and let it cool completely before transferring it to the fridge. Chill the cheesecake overnight, uncovered. 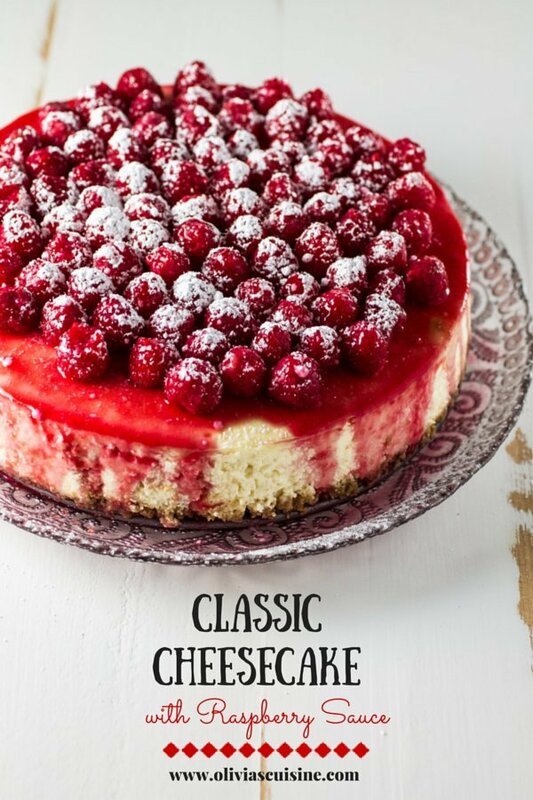 Before serving, let the cheesecake stand at room temperature for at least 30 minutes. Unmold the cake, transfer to a serving dish and top it with the sauce. Combine all ingredients in a saucepan and cook for about 10 minutes or until the raspberries are broken down. If desired, pass the sauce through a strainer to remove seeds. Let it cool and serve over your cheesecake. 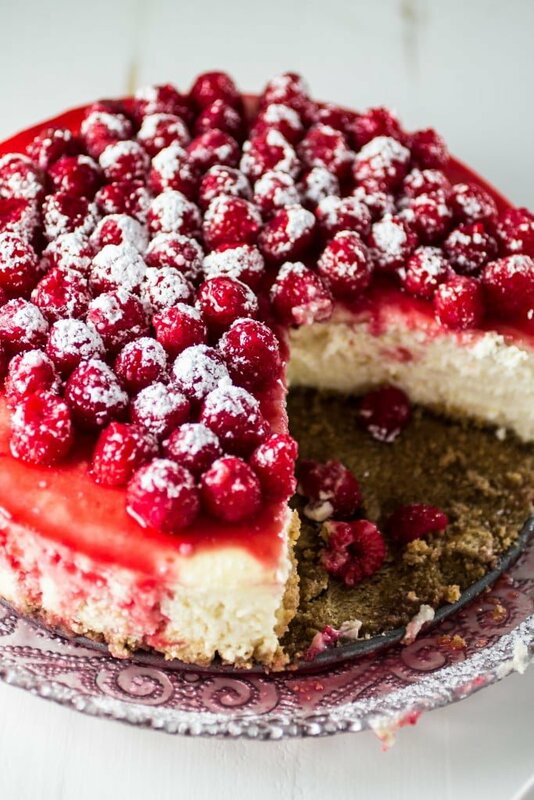 If desired, decorate the top of the cheesecake with some fresh raspberries. 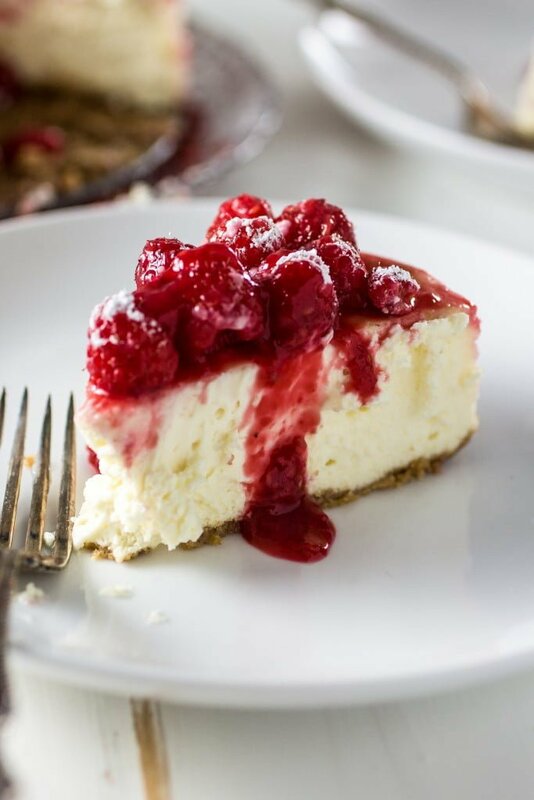 I love raspberries and what could be better than pairing them with cheesecake. Looks wonderful. i just want to say this cheesecake was phenomenal. I just made it for thanksgiving and everyone loved it! is their anyway to make it chocolate? or to incorporate fruit swirls?Thank you so much for this great recipe!! My friend, the only thing I had to say is: this is definitely a piece of art ;-) Enjoy your week! Thanks, Sabrina! You definitely need to make this cheesecake for him! lol I’m sure she loves you just fine with all the amazing things you cook! Wow! Simply stunning cheesecake Olivia! :) Your mom would love this, I mean who wouldn’t? Gorgeous recipe darling! Pinned! Love this cheesecake, Olivia! Looks super creamy and those berries are a beautiful addition! What a gorgeous cheesecake! I think you have a perfect amount of raspberries. I’m sorry you can’t spend Mother’s Day with your mom, but this cheesecake should be a nice distraction! Wow, this looks so good! You know that I love anything with fresh berries and that sauce served over the top of the cheesecake is perfect. I’ll have one slice, please! The sauce gives it an extra tanginess that I love! :) Thanks, Ashley! Great cheesecake baking tips. This is about my dream dessert! Right now I can’t get enough raspberries! I too prefer creamier and not so sweet cheesecake over dense, overly sweet ones. I love berry cheesecakes and this one looks absolutely scrumptious! Thank you so much, Thao! This cheesecake looks creamy and delicious. I love it! Looks gorgeous Olivia! Can’t wait to try it! Great combination! 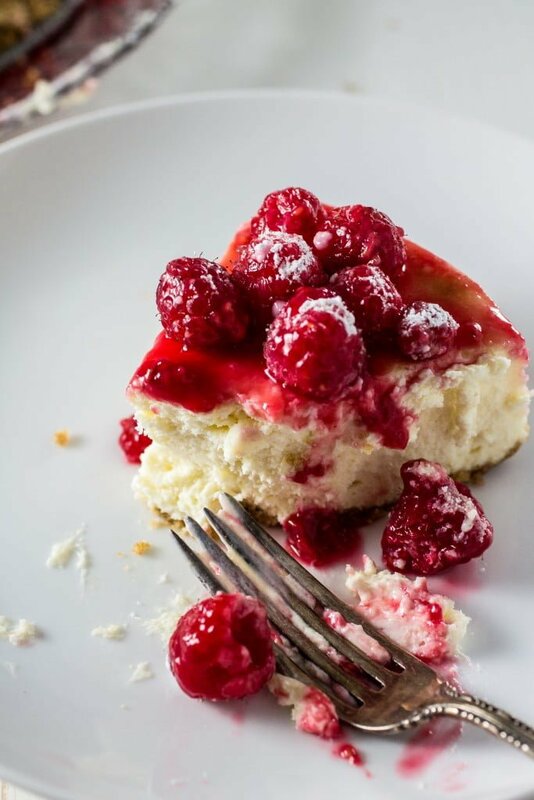 This is my favourite cheesecake: with raspberries…the perfect dish to have on mother’s day! Has anyone of the raving reviewers actually made this? The ingredients list calls for 1 cup of sour cream. There is no further reference to sour cream in the instructions. Do you proofread your recipes? I’m still going to try it, but it is very common for internet recipes to have such problems. It’s unfortunate that the more-or-less standard rules for recipe writing found in good cookbooks are ignored. If you fix this, and my cheesecake comes out good in spite of the error, I’ll consider improving the rating. Sorry if I sounded harsh before, that was not my intent. I am frustrated when I read a lot of comments from people who have not tried a recipe. I have tried yours, adding the sour cream and otherwise following the recipe exactly. It was the best cheesecake I have made so far! I am somewhat new to cheesecakes, but this one is a keeper. One thing I would suggest: do not wrap the pan in foil until after baking the crust. I use a glass-bottom pan, and like to see the crust from below. Also, there is less risk of perforating the foil in handling if you wait. Changing to 5 stars from my previous 3. After the hour of leaving the cheesecake in the oven, there were big cracks in the cheesecake. I added enough corn starch and I put the pan in a water pan. How else could I have prevented cracks? I made this for my husband’s birthday yesterday and it was an absolute hit! I used lime juice instead of lemon juice because I was out of lemon, and it was still awesome! Thanks for the recipe- will be using it again! Hi, I only have a 10″ spring form pan. What would you suggest for this size ? I made this yesterday and it turned out really well. It was really fluffy and creamy, not too dense. I didn’t use a water bath, because I didn’t have a pan big enough, but I put a bowl of hot water in the oven beside it. I made this cake exactly as written, other than inadvertently adding the eggs with the other ingredients, so I shortened the total time that I beat the batter at medium speed. Also, we started eating it before I had a chance to make the raspberry sauce, and it was so good, I never got around to it! The cake fulfills the promise….its texture and taste were perfect. This will become a permanent fixture of my recipe collection. Do you use salted or unsalted butter? And is it 2 or 3 pints of raspberries? Thank you for this amazing recipe. It was my New Years resolution to bake a cheeese cake, since I have never made one before. Based on your story and the link to your mom, my mom’s surprise birthday party was the perfect opportunity to attempt this. It worked out perfectly and was a hit! It looked and tasted fantastic. Thank you very much. I made this recipe for Christmas. Big hit! No cracks. Perfect texture, Not too sweet, Not too much of that omelet/egg flavor you sometimes get with cheesecakes. Only thing was that water got into the springform as I did Not use heavy duty aluminum foil. But after letting it sit on a kitchen towel overnight in the fridge it was still good! Couldn’t really tell actually. Definitely a keeper! Thanks for the great recipe! This looks so yummy! I’m working on making it right now for a Valentine’s Day dessert tomorrow :) If I put the raspberry topping on tomorrow just before we eat, will it hold up well over the next couple days? Or should I just cut slices and add a little bit of topping to each piece we eat rather than covering the whole cake at once? 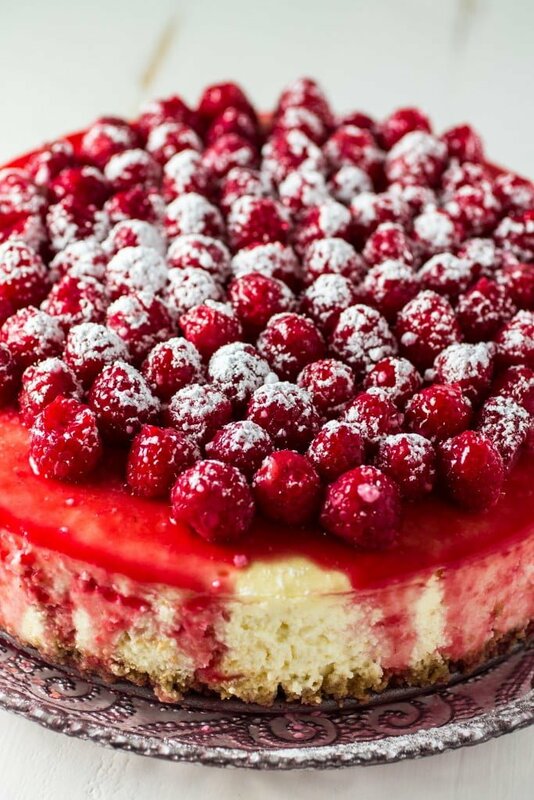 The cheesecake with the raspberries sauce was such a hit at christmas and for my son’s birthday I will be making it for Easter. This cheesecake was moist and soooo good, I never have any left overs . Olivia, I just made this for my friend’s birthday and I just received a message from her. She said this cheesecake was out of this world and it was the best cheesecake she ever had! I’m bummed I didn’t get to try it, but happy she enjoyed. I’ll have to make it for myself now! Well this recipe work without doing the water bath? I made this for my daughter birthday it turned out perfect no cracks or brown too . It was first one I made . it’s almost gone 2 days later. I have to make another soon . I don’t care for cheese cake but Angel loves it but this one was amazing . The only difference was I added a tablespoon of sugar which she said the crust was even amazing.. she is very picky..
I’m so glad it was a hit! And what a honor to have my recipe be a part of your daughter’s birthday. Wow!!! I made this but was forced to make a couple of minor changes. I used gluten free for the crust as my wife has celiac and I have an intolerance to wheat altogether. Raspberries were not avail so I used cherries. Turned out awesome!!! Thanks for the tips and awesome recipe.